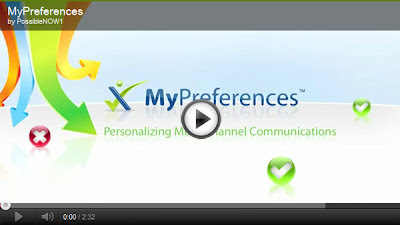 MyPreferences Blog: Where Do You Store Your Customers’ Preferences? Where Do You Store Your Customers’ Preferences? I recently dined at one of my favorite neighborhood restaurants. The waiter greeted me by name and mentioned the daily seafood special because he knew that I was fond of sea bass. He also suggested a wine that I might enjoy based on past dining experiences. I was pleasantly surprised at how he remembered my preferences, because this level of personalization made me feel like my business was appreciated. So, how did this waiter remember so much about me? I honestly don’t know. Maybe he just has an amazing memory. The rest of us need more than an incredible memory to keep up with our customers’ preferences since marketing personalization is an important aspect of building customer loyalty. You’ve probably experienced this if you have ever shopped with online retailers such as Amazon. Their web site displays other items that might be of interest based on your previous purchases. By honoring consumer marketing preferences, you enable the consumer to define the vendor/customer relationship. This type of preference management can include the desired communication channel such as phone, email or text message, and even the frequency of the messages. You may even define preferences by product offering. For instance, a sporting goods retailer could let customers choose the product areas of interest by sport such as golf, tennis, soccer, or softball, the desired communication channel, and the frequency. As an avid golfer, I’d prefer to receive text messages on golf items on a frequent basis. However, my interest in tennis is more limited, so a once a month email would suffice. Of course, to do this level of preference management well requires a technology solution with a persistent preference center. That would enable customers to change or update preferences based on interest, communication channel or frequency. I’d like to hear your thoughts on managing and maintaining customer preferences. Tell me what you think! How Does Personalization Differ From Preferences?